1919 Giro winner Costante Girardengo came to the 1921 Giro in such fantastic condition he won the first four stages, but a crash in stage five forced him to abandon. 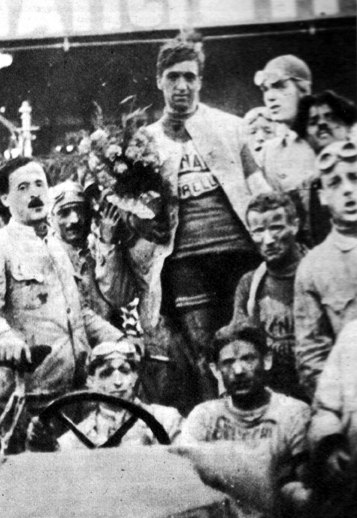 With Girardengo's departure, the race was between Giovanni Brunero and Gaetano Belloni. In Stage 7 Brunero was able to leave Belloni two minutes behind, creating a GC gap of about one minute, which Belloni was unable to erase. 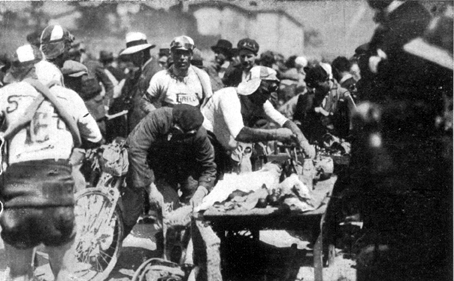 In 1921 the Giro organizers took the Giro as far south as Naples in a 3,106-kilometer, ten-stage race. A peloton of 69 riders headed east from Milan on May 25 to start a clock-wise journey around the peninsula. By this point, the Giro had grown so important that the race was being filmed to be shown later in movie theaters all over Italy. Girardengo and Belloni were among the starters. Gira was in scintillating condition, having won Milan–San Remo in a convincing manner earlier that spring. Giovanni Brunero was in his third year as a pro and so far had earned three notable placings. In 1920 he was second in the Tour of Lombardy, victor in the Tour of Emilia and second to Girardengo in a two-up sprint in Milan–San Remo. In that Milan–San Remo the two riders had left Giuseppe Azzini and Alfredo Sivocci three and a half minutes back and the rest of the peloton from eight minutes to an hour behind. Some of the old guard were still there as well. Rossignoli, Galetti, Sivocci and Santhià lined up to give it another go. Marcel and Lucien Buysse were part of a five-man Belgian contingent in a race that was, as usual, largely an Italian affair. The commercial benefits of being involved with the Giro were not lost on Italian businessmen. Adolfo Galeppi, head of the Milan office of the Swiss Tobler chocolate company, said he would supply all the independent riders with free chocolate. Probably looking for an ad from the chocolate company, La Gazzetta called the gesture munificent. Given the conditions some of the independents raced under, I have no doubt the chocolate was gratefully accepted. For the first time the Giro went over what is now one of the iconic climbs in Italian cycling, the Ghisallo, just north of Milan. The first stage ascended the famous colle on its way to Merano in the Dolomites, north of Bolzano. After stage one there could be no doubt about Girardengo’s form. After racing 333 kilometers, Girardengo out-sprinted Belloni, Sivocci and the rest of the 22-man break that had gapped the field by over sixteen minutes. Riders climb through Storo, near Trent, on muddy streets. For the era (actually any other era as well), this was an extraordinarily tight stage race. The fifth stage was over difficult and hilly Apennine roads that were to be unkind to Gira. Colliding with another rider, he crashed, ruining his bike. Like the year before, Belloni led the opportunistic attack. Girardengo gave desperate chase for 60 kilometers, but eventually even champions become exhausted and their determination can falter. When he reached the Cinquemiglia Plateau (near Isernia, due north of Naples) he decided that further pursuit was pointless and got off his bike. He knelt in the dirt and made a cross in the dust of the unpaved road and crossed himself. He then sat on a wall, his Giro over. The remaining riders in the peloton continued on to Capua, north of Naples. There some boarded a train to Naples because the road was nearly impassable by bike. I can find no record that they received any penalties for this. The crowd awaiting the racers at the finish was enormous. 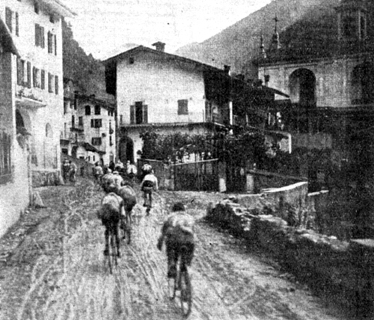 Belloni won the stage; Brunero and Bartolomeo Aymo were second and third, with the same time. Since Aymo will turn up again and again in our story, it might be helpful to note that French (and some Italian) journalists spell his name “Aimo”. Aymo or Aimo, it’s the same guy. With Girardengo gone, Belloni was the new leader and was sure he had the race in the bag. This seems a tad optimistic, given how close the race was. It was in the seventh stage to Livorno that Brunero was finally able to distance himself from Belloni and Aymo. La Gazzetta described Brunero as a passista-scalatore, a rider who could roll the big gear easily over flat roads yet climb well. In stage seven Brunero used those talents to good effect by leaving Belloni two minutes behind, giving him a 52-second overall lead. Although Belloni won the last two stages, he couldn’t erase his entire time deficit, making it the closest Giro so far. He went back to being Italy’s “Eternal Second”. A look at the final results shows that Brunero and Belloni were the class of the race, vastly superior to the rest of the field. Showing the improving form of the post-war peloton, 27 of the 69 riders who left Milan three weeks earlier returned.